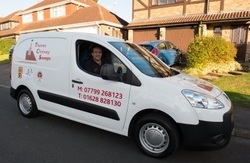 Based in Knowl Hill between Maidenhead and Reading, we offer professional chimney sweep ﻿services﻿ and are members of ﻿The Guild of Master Chimney Sweeps﻿. We are fully insured and issue an industry standard Certificate of Chimney Sweeping recognised by insurance companies. We will also carry out a smoke draw test after your chimney has been swept.